Yoga has evolved and intertwined in my life over the years so that it is truly a part of my every day. When I was first introduced to yoga, I was more interested in the physical aspect of the yoga practice and how to get that “yoga body.” As the years have gone by, the practice has really turned inward and become more about the inner stillness. It has become more about being where I am…in the moment and how to find ease. 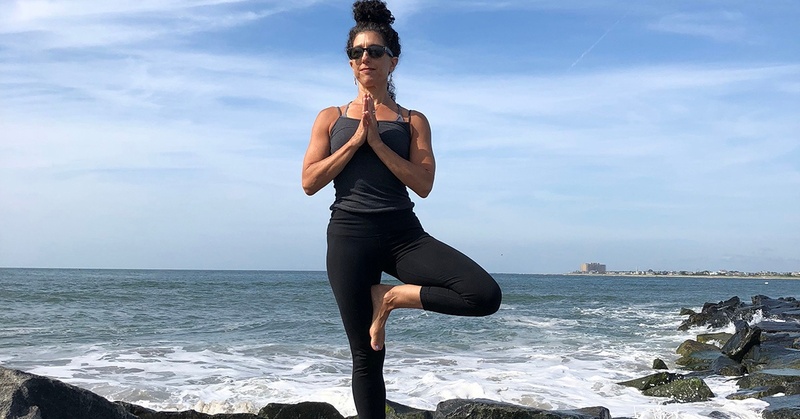 When you can find ease in a challenging pose, that practice really does translate off the mat and into other challenging situations – finding ease waiting in line, in traffic, or on an annoying phone call for instance. When you learn how to access that ease, find that breath, you can bring yourself back to center and find peace. For me, yoga is a moving meditation. I like Vinyasa yoga, which links each breathe to a movement. By focusing on the breath, I can keep my mind quiet. When I notice my mind wandering, I come back to my breath. It’s a practice! That’s the thing about yoga, it is a practice. The layers are never-ending. There is always something to learn. Sometimes just getting on the mat is challenging enough. Over the years, I have learned to allow myself to come into Child’s pose, which is a resting pose; this has been one of the more challenging poses for me. Learning to listen to myself – the subtle messages of when to move and when to rest and then even more importantly to respond to these messages with compassion and grace has been a lifetime of learning. You never become a yoga master because there is always more, you can always go deeper and yet you must also always be just where you are. Doing yoga is about what quality of breath, mindfulness and compassion you bring to yourself on the mat. Each day is a different day and being present with yourself on your mat with your breath is the goal. Yoga has become very popular and I welcome the variety. Each person is drawn to yoga for their own reasons. But the common thread of yoga is the movement through breath. When you bring breath into movement, you nourish the body. There are many styles of yoga out there, and I would suggest trying them all! Find the yoga style that suits your personality. There is no wrong yoga, in my opinion. A yoga practice could mean so many things – we create our own yoga practice by what we bring to our mat and what we let go of on our mat. Bring your patience – let go of your expectations. Since I have been traveling down this yoga road for decades now, it seemed natural that teaching would be the next step in my practice. Teaching has offered me yet another perspective into my yoga practice. Preparing sequences and thinking about how to queue poses for a class has made my practice deeper and stronger. I am very grateful to be able to share this practice with others. The light in me bows to the light in you…Namaste. Join Lauren for her Vinyasa yoga class on Fridays at 5:30 p.m. in our Doylestown location. All levels are welcome – the Friday class is challenging but can accommodate all levels. Try Lauren’s class for free: Contact Cornerstone Clubs for a FREE Class Pass!